In the past, an inspection glass, fitted in the overboard discharge pipe of the oil/water separator permitted sighting of the flow. The discharge was illuminated by a light bulb fitted on the outside of the glass port opposite the viewer. The separator was shut down if there was any evidence of oil carry over, but problems with observation occurred due to poor light and accumulation of oily deposits on the inside of the glasses. Present-day monitors are based on the same principle. However, whilst the eye can register anything from an emulsion to globules of oil a light-sensitive photo-cell detector cannot. Makers may therefore use a sampling and mixing pump to draw a representative sample with a general opaqueness more easily registered by the simple photo-cell monitor. Flow through the sampling chamber is made rapid to reduce deposit on glass lenses. They are easily removed for cleaning. Bilge or ballast water passing through a sample chamber can be monitored by a strong light shining directly through it and on to a photo-cell (Figure 1). Light reaching the cell decreases with increasing oil content of the water. 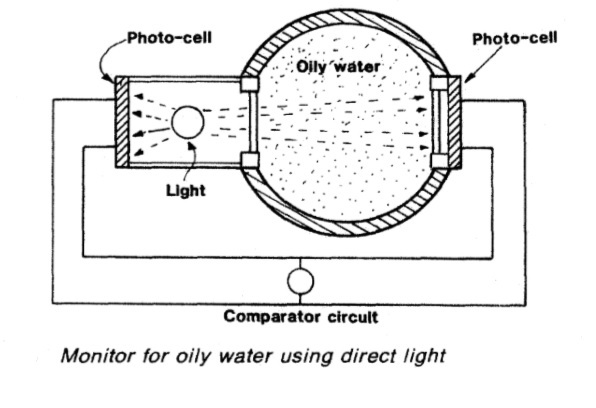 The effect of this light on the photo-cell compared with that of direct light on the reference cell to the left of the bulb, can be registered on a meter calibrated to show oil content. Another approach is to register light scattered by oil particles dispersed in the water by the sampling pumps (Figure 2), Light reflected or scattered by any oil particles in the flow, illuminates the scattered light window. This light when compared with the source light increases to a maximum and then decreases with increasing oil content of the flow. Fibre optic tubes are used in the device shown to convey light from the source and from the scattered light window to the photo-cell. The motor-driven rotating disc with its slot, lets each light shine alternately on the photo-cell and also, by means of switches at the periphery, causes the signals to be passed independently to a comparator device, These two methods briefly described, could be used together to improve accuracy, but they will not distinguish between oil and other particles in the flow. Methods of checking for oil by chemical test would give better results but take too long in a situation where excess amounts require immediate shut down of the oily water separator. 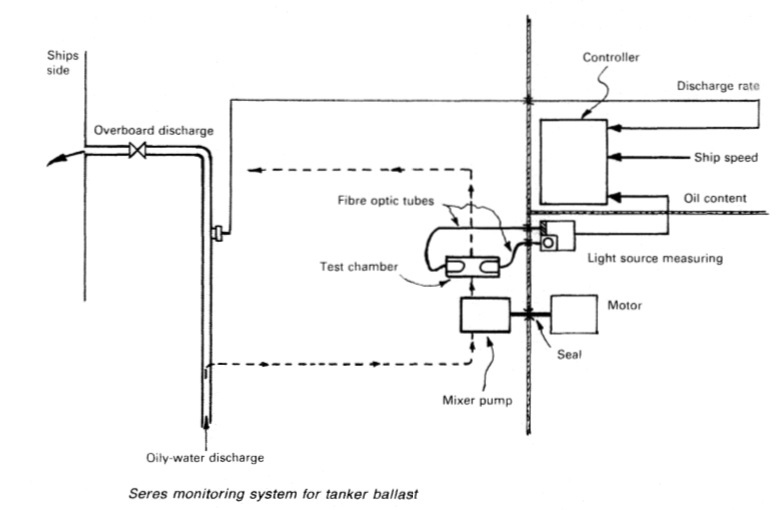 Sampling and monitoring equipment fitted in the pump room of a tanker can be made safe by using fibre optics to transmit light to and from the sampling chamber (Figure 3). The light source and photo-cell can be situated in the cargo control room together with the control, recording and alarm console. The sampling pump can be fitted in the pumproom to keep the sampling pipe short and so minimize time delay. 2. to keep the slops segregated from the loaded cargo, either by arranging for slops to be discharged to shore before loading, or keeping slops on board, but segregated, and paying freight on them plus the deadfreight incurred as a result of a full cargo no longer being carried to the discharge port. If the charter party gives the charterers the option of dealing with slops as they decide, but the vessel arrives at the loading port with more slops than can be carried (segregated) along with the full contemplated cargo, the owners may be in breach of contract.